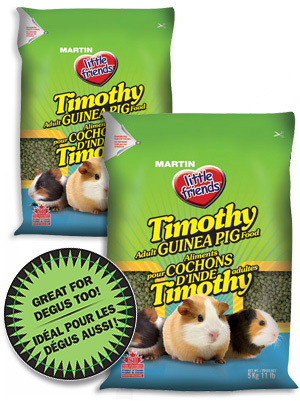 When introducing new food, gradually increase and mix Little friends™ Timothy Adult Guinea Pig Food with the existing diet over a 7-day period. A suggested feeding guideline is ¼ to ½ cup per day. Adjust the amounts to maintain your pet's best condition. Always discard any uneaten food and clean the dish before the next feeding. Provide fresh water at all times.